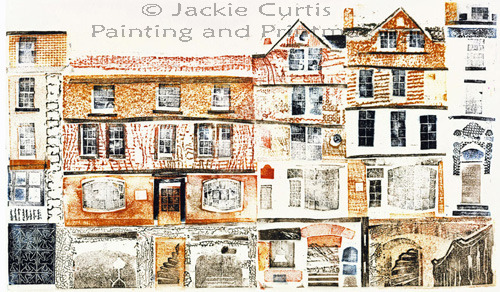 Giclee print reproduction of 'Stories in Storeys' from Limited Edition Collagraph Print of North Parade Passage Bath including Sally Lunns by Jackie Curtis. The original Collagraph blocks used a variety of materials including several floor clothes and a piece of sack. The original print was too large for my press so it was produced on the drive with my neighbour's garden roller. Full size print also available please contact me for more info. The print was produced for the 2009 'Bath Prize' a link to their site is contained in the 'Links' section and the Giclee print was printed by the organisers.